Just because there are a number of capable pickup trucks currently on the market, it doesn’t mean that one individual model can’t stand above the rest. This is especially evident when you begin comparing the 2017 Chevy Silverado vs. 2017 Ram 1500. From an outsider’s perspective, the two trucks seem relatively similar. However, once you start to explore the various specs, features, and capabilities of the two offerings, it becomes painfully obvious who wins in the competition between the 2017 Chevy Silverado vs. 2017 Ram 1500. Pickup trucks are seemingly becoming synonymous with power, and that sentiment is certainly emphasized in both the 2017 Chevy Silverado 1500 and 2017 Ram 1500. Well the power specs may be comparable, the Silverado separates itself with phenomenal fuel efficiency. Thanks to Chevy offering three different engine options with the 2017 Silverado 1500, drivers can seek whatever system fits their needs and requirements. The 4.3-liter V6 engine is for those seeking optimal fuel efficiency. When the pickup is equipped with this unit, drivers can anticipate a highway fuel efficiency of 24 miles per gallon. Despite this excellent fuel economy, the system is still capable of cranking out 285 horsepower and a best-in-class 305 pounds-feet of torque. These power specs play a significant role in the 7,600-pound towing capacity. For those seeking power, then the 6.2-liter V8 is the right choice, as the unit produces a mighty 420 horsepower and 460 pounds-feet of torque, leading to a best-in-class 12,500-pound towing capacity. Even then, drivers can still expect a 21-mile-per-gallon highway fuel efficiency. Finally, the 5.3-liter V8 provides the best of both worlds. The engine delivers 355 horsepower and 383 pounds-feet of torque, resulting in an excellent 11,100-pound towing capacity. Plus, the system promises a 23-mile-per-gallon highway fuel efficiency, so drivers won’t have to sacrifice more money at the gas pump. 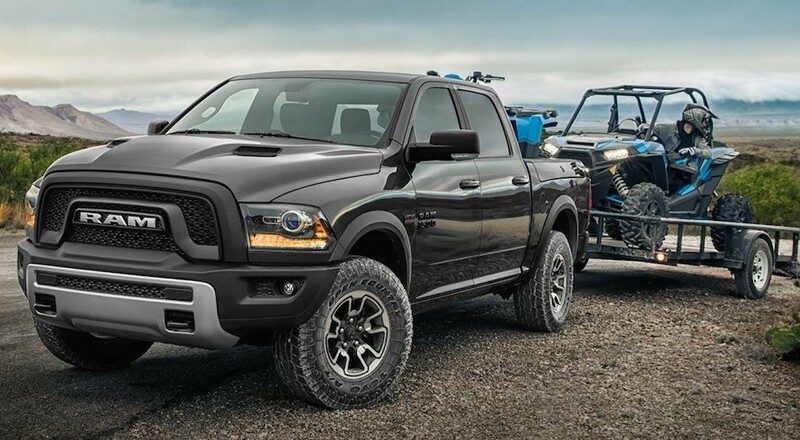 Similar to the Silverado, the 2017 Ram 1500 also provides customers with three engine options, although none of the offerings come close to matching the impressive specs delivered by the rival truck. The 3.6-liter Pentastar V6 engine is the smallest of the bunch, cranking out an underwhelming 305 horsepower and 269 pounds-feet of torque. Thanks to technologies like the Thermal Management System, drivers can also anticipate a 25-mile-per-gallon highway fuel efficiency. For upgraded power specs, customers can opt for the 5.7-liter HEMI V8 engine, which pumps out 395 horsepower and 410 pounds-feet of torque. Predictably, fuel efficiency suffers, coming in at only 22 miles per gallon on the highway. Finally, the 3.0-liter EcoDiesel V6 engine is for those seeking a diesel alternative, although the system does lack in the power department. The 29-mile-per-gallon highway fuel efficiency is certainly impressive, but the 240 horsepower and 420 pounds-feet of torque leaves a bit to be desired. Considering everything a pickup truck can offer to its owners, some customers may assume that the vehicles don’t deliver an ideal driving experience. Chevy’s engineers have eliminated this misconception, equipping their Silverado with a number of comfort, convenience, and entertainment features. It’s unlikely that drivers will be able to find a quieter ride elsewhere, as Chevy’s engineers cleverly added triple-seal inlaid doors and a new aerodynamic windshield. Thanks to these inclusions, occupants won’t be distracted by the humming engine or howling wind. Meanwhile, the dual-resilient foam seats provide optimal comfort, meaning occupants shouldn’t be experiencing any discomfort after having completed a long trek. During that journey, drivers can take advantage of their Chevrolet MyLink system, providing them with access to a number of useful applications, whether it be a navigation service or vehicle diagnostics. Of course, drivers can also listen to their favorite radio stations, and thanks to the Bluetooth compatibility, they can even make hands-free phone calls. Fortunately, you shouldn’t worry about your phone losing any juice, as the wireless charging dock will keep your smartphone charged at all times (occupants could alternatively rely on the USB ports or 110-volt power outlet). The Ram 1500 seemingly skimps out on the comfort features, although they slightly make up for it in entertainment and storage. The Uconnect 8.4-inch touchscreen serves a similar purpose as the MyLink system, providing access to 3-D maps and SiriusXM radio. The accompanying SiriusXM All Access Package provides drivers with other amenities, like the SiriusXM Traffic Link, which will allow the operator to anticipate any delays. The accompanying seven-inch Digital Cluster is another technological enhancement, delivering essential and easy-to-read information. Besides the storage space coming from the pickup’s truck bed, drivers can also capitalize on the in-floor storage, allowing them to keep all of their tools organized and secured. Even the dashboard glove box could be a clever place to hide your most valuable equipment (assuming it fits). There shouldn’t be any worries regarding occupant safety when traveling behind the wheel of the 2017 Chevy Silverado 1500 or the 2017 Ram 1500. Each vehicle is equipped with a number of safety features that shouldn’t only protect during a collision, but prevent those collisions from even occurring. Whether you’re going to be using your 2017 Silverado 1500 as a commuter or a worksite assistant, you’ll surely be relying on the pickup’s extensive safety features. Engineers included a number of technologies that should play a significant role in reducing accidents, like the Low-Speed Forward Automatic Braking, Lane Keep Assist, Forward Collision Alert, Safety Alert Driver Seat, Front and Rear Park Assist, Rear Vision Camera, and Side Blind Zone Alert. In the event of an emergency, occupants can trust the high-strength steel safety cage to keep them safe, and the six standard air bags should protect their well-being. If necessary, drivers can even contact an OnStar Advisor via the OnStar Automatic Crash Response system, and this individual will subsequently send emergency personnel directly to the crash site. The Ram pickup does an admirable job of delivering some useful safety features, but there’s no denying that the brand doesn’t come close to offering the capabilities provided by the Silverado. It starts with the high-strength steel frame (and the accompanying Hydroformed Tubular Front Frame Unit and Eight Ultra-Tough Crossmembers), which should maintain its structure during a collision. The side-curtain airbags should provide the necessary amount of cushion, while the Dynamic Front Crumple Zones should keep a crash’s energy away from the passengers. There are several features that should help drivers avoid accidents altogether. The ParkView Rear Back Up Camera allows drivers to monitor everything that’s happening behind their vehicle, making it easier to reverse and anticipate any approaching vehicles. The ParkSense Front Park Assist System plays a similar role, maintaining the front of your pickup’s like-new condition. It’s fairly obvious who the superior option is in the competition between the 2017 Chevy Silverado and the 2017 Ram 1500. So what are you waiting for? Ignore those Ram dealerships and head down to McCluskey Chevy today!